So I grabbed an orange, and over the phone, she talked me through the following exercise. Unbeknownst to her, this changed my entire way of eating. My sister learned the following technique from a psychologist as a calming and focusing exercise, but as a nutrition expert, I had other ideas about its application. The benefits of mindful eating include learning when to start and stop eating, learning to better manage emotional eating, practicing being present, improving digestion and absorption of your food, and increasing your awareness of how you feel after you eat. If you are part of a Living Wellness Growth Group, you will do mindful eating together. However, you are welcome and encouraged to practice on your own as well! 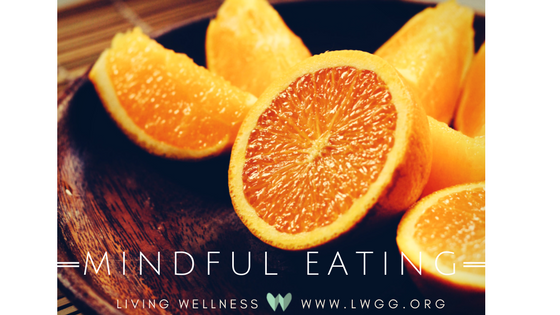 This exercise works best with an organic citrus fruit, such as an orange or grapefruit, but be encouraged to practice mindful eating at every meal and snack. If you are allergic to citrus fruits, practice with an apple, pear, or a half-cup of strawberries instead (skip the peeling). Step 1: Hold the fruit in your hands. Carefully take in the sight. Notice the color, shape, and texture. Focus only on the fruit. Take a deep breath. Step 2: Peel the fruit (if applicable). Notice the smell, the color change, and the texture. Continue breathing deeply and relax your shoulders. Step 3: Put one small piece of the fruit in your mouth. Notice the taste, the smell, and the texture. Chew slowly. Breathe deeply. Step 4: Continue eating the rest of the fruit, slowly, taking in all the senses as you eat. Step 5: Notice how you feel after you have eaten the fruit. Do you feel satisfied? Do you feel good? Step 6: Once you’re finished eating, let go of thoughts about food. The inability to release thoughts about food is at the root of our most challenging eating habits. Moving away from thoughts about food gives us the freedom to direct mental and emotional energy toward God. Be glad for the experience, and be satisfied with your choice of fruit and the amount. Let your mind move away from food and on to giving thanks. Step 7: Give thanks. Thank God and ask him to nourish your body with the fruit. After practicing mindful eating, what are your thoughts? How do you feel after practicing the exercise? How do you feel thirty minutes later? Do you feel satisfied or do you want more food? How will practicing mindful eating transform your health and your relationship with food? When will you practice mindful eating each day of this week? We would be wise to practice mindfulness in all areas of our lives. How can you practice mindfulness to improve your relationship with God? God desires us to enjoy our food with great pleasure—not just the taste but the experience. Why else did he give us a nose, taste buds, and endorphins? Next time you eat, use all your senses and enjoy the experience! Then, remember to rest while you digest. Like what you read here? This was an excerpt from Living Wellness for Growth Groups (p. 107-108) which is available for purchase on our website, Amazon, and Itasca Books.